The Adobe AIR for Linux alpha is a version of the Adobe AIR runtime that allows Adobe AIR applications to be deployed on computers and devices running the Linux operating system. In addition, Adobe Flex Builder for Linux can be used to build rich internet applications that deploy to the desktop and run across operating systems using proven web technologies. So we can now test our AIR applications on Linux but unfortunately at this stage the Adobe AIR for Linux alpha is not feature complete yet. Thanks to our sponsors, they're very happy to announce that day one of 360|Flex Europe will be free to all. Yup, you read correctly: Monday, 7 April, of 360Flex will be open to the general public. Day 1 of the 360Flex Conference is now Free. This means that anyone who shows up on Monday April 7 at the conference will get in for free. They can enjoy any of the 9 great sessions, the Adobe Keynote and the FREE Flex 101 hands on training. Because Day 1 is free, we've knocked a third off the price of admission. Therefore, it's now only 240 euros to attend on Tuesday and Wednesday. That's great. Adobe has launched the public beta of Photoshop Express, a Flex-based Rich Internet Application. The fantastic thing is that it is totally free ! The RIA allows you to store, sort and show off digital photos with eye-catching effects. Thanks to Serge Jesper for the update: John Nack is saying that an AIR-version is coming soon which will enable offline image editing and printing services. I've just finished my blurb about the session I'll held at the 360Flex Europe. There were a lot of different interesting sessions in my mind: Flex and Java integration, Livecycle Data Services development, introduction to BlazeDS development .... But at the end I've decided for a topic where we're really involved in this period in Comtaste: integration between Flex and AJAX. We're working in two projects where we're using the Flex AJAX bridge and other tecniques to communicate between Flex and AJAX, and the AJAX Data Services. So many people believe that Flex and AJAX are competitor. Of course they're both great technologies to develop Rich Internet Applications. But they're old friends. AJAX is the right choice because of its open nature and standard based languages, while Flex is good for interoperability in browsers (because of the ubiquity of Flash Player) and for its large set of components ready to use and to extend. As Serge Jesper wrote on his blog, the 360Flex Europe has an impressive speaker list that has a great mix of well established names but also a bunch of cool new names. New speakers means new fresh voices and ideas that they can share and we can learn from. I personally know most of the new speakers and they're all great Flex developers. Let's see on Monday at 2.30 pm. Download the 360Flex schedule. I've missed the news while travelling. I read on Serge Jesper's blog that Midnight Coders has changed its business model and it will release WebORB for .NET for free ! 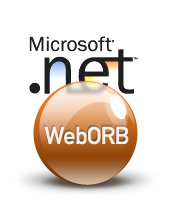 WebORB for .NET provides advanced features for your .NET infrastructer for data pushing, RemoteObject using AMF3 and message broadcasting. 360Flex Europe is very close and there are a lot of good reasons to partecipate (you can read Comtaste's post). The price to join the event is very low considering the 3 days of technical sessions that you'll be able to attend. FlexGala has the opportunity to give a discount coupon to receive a special discount of 60 euro. It will decrease the price to 300Euro for the entire conference. If you're a member of FlexGala you'll receive the newsletter with the code to insert in the registration page. Or you can email me and I'll be happy to send it to you ! MAX 2008/2009 will be held in San Francisco, California, Milan, Italy and Tokyo, Japan. MAX is an experience unlike any other, an opportunity to connect with thousands of designers, developers, partners, executives and Adobe staff for education, inspiration, and community. Mark your calendar. You will not want to miss the opportunity to participate ! Tribunale di Cremona is an efficient unit of the Italian legal system. 14 judges and 50 employees work at the court which assembles about 7 times a week, tackling 12 to 13 criminal trials each time. Tribunale di Cremona has been using computer technology for quite some time, following guidelines from the Digital Administration Code. Efficiency and speed have inspired several projects including the conversion of documents to digital format done in collaboration with Adobe. For the past several years, all papers related to pre-trial conferences have been available in Adobe Portable Document Format (PDF). Starting recently, all court papers associated with a trial are available in digital format only. Goodbye Boston.New York and AJAXWorld 2008 here I come! On Saturday I arrived in New York and after a quick journey I leeft the Big Apple to go meeting Alessandro Pace in Boston. We spent an incredible day and he was my "Cicerone" showing me all the interesting stuff in Boston, Cambridge, Harvard, the MIT, the Boston College and a couple of sweet and awesome places for drinking and eating ! This morning I'll leave for New York again where the AJAXWorld 2008 Conference is waiting for me (actually not only me ;)). I'm preparing my luggages for my tomorrow's flight to New York city. 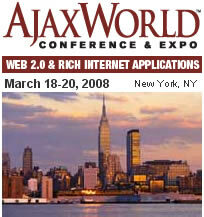 I'll spend 5 days in the Big Apple for speaking at the AJAXWorld Conference 2008. And it will be the occasion to go meeting my friend Alessandro in Boston on this weekend ! So I'm sure I'll have great time. I'm thinking about some friends of mine that live in NY to have some great time with them !